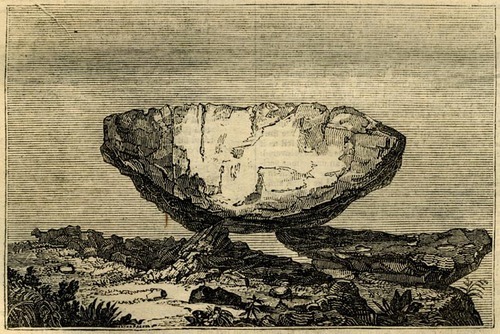 THE accompanying engraving exhibits a view of an insulated rock, popularly termed a Cromlech, standing on a moor in the parish of Constantine, in Cornwall, and called by the people of the country "The Tolmen." The surrounding scene is wild in the extreme, the whole moor being thickly covered with enormous blocks of granite, forming altogether a subject worthy of the pencil of a Salvator Rosa. The origin of these rude monuments of ancient times is buried in the darkest obscurity, and must consequently be left entirely to conjecture, though all antiquaries appear to agree in attributing them to the Druids, but are much divided in their opinions as to the purposes for which they were erected, some supposing them to have been sacrificial altars, others, again, considering them as monuments erected over the ashes of illustrious persons. The circumstance of Kistvaens, or stone chests, having been discovered under some of them, favours this latter opinion. Mr. Rowland, in his Mona Antiqua, is inclined to consider them as intended for purposes of sacrifice, and supposes the word Cromlech to be derived from the Hebrew compound curamluach, a devoted stone, or altar; that he should have had recourse to the Hebrew for a derivation is extraordinary, the British word itself being so significant; for Krwm, in that language, is crooked or inclining, and Llech is a stone, and the superincumbent stone, or roof of these monuments, is always in a slanting position, in a greater or lesser degree; that of the Tolmen inclines very little. It is not improbable but that they might have been used for both the above-mentioned purposes, and also as the presidial chair, or seat of the chief Druid at their grand national assemblies. We learn from Caesar that the Druids were the judges, and arbiters of all differences both public and private, and that they held an assembly every year, at a certain place, in the middle of the country, and consecrated for the purpose, where they took cognizance of murders, inheritances and boundaries, and decreed rewards and punishments. It is probable that this annual meeting took place at Stonehenge, and that inferior tribunals were held periodically in remote districts, where these stones are found, and as has been before observed, they probably served as the presidial chair; and as sacrifices were offered up at their religious assemblies, the victim was also slain upon them. There is a hollow of the diameter of about a foot and a half scooped out on the summit of the Tolmen, which might have been intended as a receptacle for the blood as it flowed from the victim. It is curious that the word "Tolmen" may be traced to the British words Toll, (the double ll being pronounced as Ith,) tribute, and Maen, a stone, from whence a question would arise worthy the consideration of antiquaries; Did the Druids receive tribute from the people? And if so, was it received as dues belonging to them as a priesthood, or ministers of religion? What most fully establishes the hypothesis that these monuments are the works of the Druids, is the fact, that they are found only in those countries where Druidism prevailed, namely, in Gaul, Germany, and Britain, its chief seat in the latter country being the Isle of Anglesey, the ancient Mona. The "Tolmen" points due north and south, is 33 feet in length, 18 feet in width in the widest part, and 14 feet 6 inches in depth, 97 feet in circumference, and is calculated by admeasurement, to contain 750 tons of stone. Extracted from The Saturday Magazine, Vol. VI, No. 68, February 14th, 1835. Published by JOHN WILLIAM PARKER, WEST STRAND, LONDON; under the direction of the Committee of General Literature and Education, appointed by the Society for Promoting Christian Knowledge.